The Buildbase Honda team ended the 2014 Maxxis British Motocross championship in some style yesterday in the final round at Foxhill in Wiltshire, with Elliott Banks Browne taking overall victory on his Honda CRF450R after a race win, a second and a third in the three motos. Banks Browne was joined on the podium by Buildbase Honda team-mate Brad Anderson, who took third overall after three impressive performances that kept him in third place in the final championship standings. Meanwhile, the third Buildbase Honda rider, Nathan Parker, having announced his retirement last week, took strong top ten finishes in his final three races for the team. In the first moto yesterday, Banks Browne went into an early lead, eventually settling for second place, while Anderson, after a slow start, had to push all the way to the flag to finish just behind his team-mate in third. Parker finished in eighth place. Banks Browne took the holeshot again in race two and powered away to a comfortable win. Anderson had another bad start but battled his way through the field to take fourth, with Parker finishing in sixth. Race three saw Banks Browne take another holeshot but he was passed by new British champion Shaun Simpson. In the final stages, he also came under pressure from Anderson and was passed by his team-mate on the final lap to finish third. Parker put in another solid top ten finish, taking seventh in his final ride for the team. 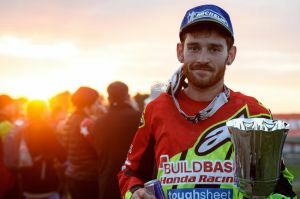 In the Maxxis British MX2 championship, Putoline Apico Honda’s Neville Bradshaw took seventh overall on his CRF250R with a third place finish in race two. James Harrison was 14th overall. It’s so nice to see two of our riders on the podium today, not only for our sponsors but also for the mechanics Willy and Ryan. When your riders have problems through injury or lack of form, the workload for these guys is the same, and 15-hour days are tough when the results are not there. So I am really happy for them because they are the backbone of the Buildbase Honda team. Today has been a really good day for me – I got my first race win in MX1 and then got my first overall victory, and I was riding really well today. This season has been a tough one with my shoulder injuries and then my back injury before FatCat. Coming into this round I felt strong and knew that I could do well. I just wanted to show that I’m capable of winning in MX1 and finish the season off on a high note, and now I look forward to the future. It’s been an up and down day for me. I suffered a problem in qualifying and had to run back to the work area and get the spare bike and finished Superpole in 12th. Then in the races I suffered from bad starts, otherwise I feel I could have won today as I had the pace. I got a third in the first race and then in the second race I had a problem with the front end on the last lap and Barr passed me on the last corner. In the last race I had to ride really hard to finish second and get third in the championship, which I’m really pleased about. After announcing this week that I would be retiring from British Championship motocross after this weekend I just wanted to have a solid day and avoid getting injured. The track today was OK but there was a lot of roost to deal with. I’m happy with my results for sixth overall and now I’m looking forward to my next chapter. 1 Simpson 464, 2 Whatley 355, 3 Anderson 320, 4 Irwin 319, 5 Krestinov 282, 6 Watson 271, 7 Snow 227, 8 Banks Browne 225, 9 Nicholls 216, 10 Ratsep 181, 15 Parker 130.